Hello Sweeties!! Hope you all are doing well. Summer has already set here; in Ahmedabad. To make my hot days easy, I decided to purchase a pair of cool sun-glasses few days back. As I love to shop online, I decided to try Lenskart.com this time. I heard a lot about this website that it is an ecommerce website with India’s largest eyewear collection online, I thought to try it. Today I am sharing my shopping experience with Lenskart.com and my review about their collection and website both. Lenskart.com is India’s leading shopping portal which offers complete range of eyewear including Eyeglasses, Sunglasses, Frames and Contact Lenses too. It offers great discounts on major eye-wear brands. Honestly, when it comes to eyewear; especially when I have to choose any frame or sun glasses, I am too particular. I don’t like to experiment too much with it but this time when I saw huge collection of shades on Lenskart, I decided to go beyond my typical choice of sunglasses. This time I decided to try round frame on my face as it is in trend these days, and I think it will suit me. Believe me; I was so happy to see whole range of round eyeglasses on Lenskart. It is always good to get some nice options while buying eyeglasses and I got it Whoot!! Whoot!! I picked two things for me. Pair of Sunglasses by Vincent Chase Price Rs – 499. I got good deal here, as I saw very similar glasses from the same brand for Rs 899 at an optic shop near my home. So, I saved 400 Rs at least. Here is my second pick. I ordered 2 Packs of BAUSCH & LOMB Monthly Disposable Contact Lenses which has 3 Lenses in each pack. So total I got 3 pairs of Contact Lenses in 2 packs for Rs 500. Optic Shop sells it for Rs 600 here. This way I saved another 100 Rs. So total I saved 500 Rs While shopping with Lenskart.com (Suppa Happy Me!!! ) You know what?? I pat myself always when I save money while shopping online. This time I did it too; all thanks to Lenskart. As a part of my work (Internet Marketing, SMO and Blogging), I see dozens of website everyday and to be very honest, this is one of the most user friendly Indian Ecommerce website I have seen. 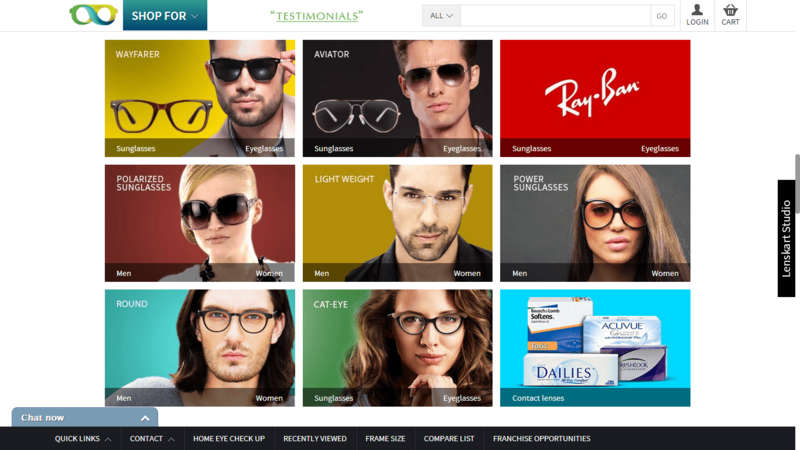 Like all other ecommerce shopping portals, Lenskart has all basic functionality like, excellent user interface, Clean Design, Easy Navigation, Soothing Colors, Sorting and Filter Facility, easy checkout etc. But What I like the most is: they have included real reviews on each product page. For example, as I said above, I ordered contact lenses, which has excellent reviews (See Image Below). 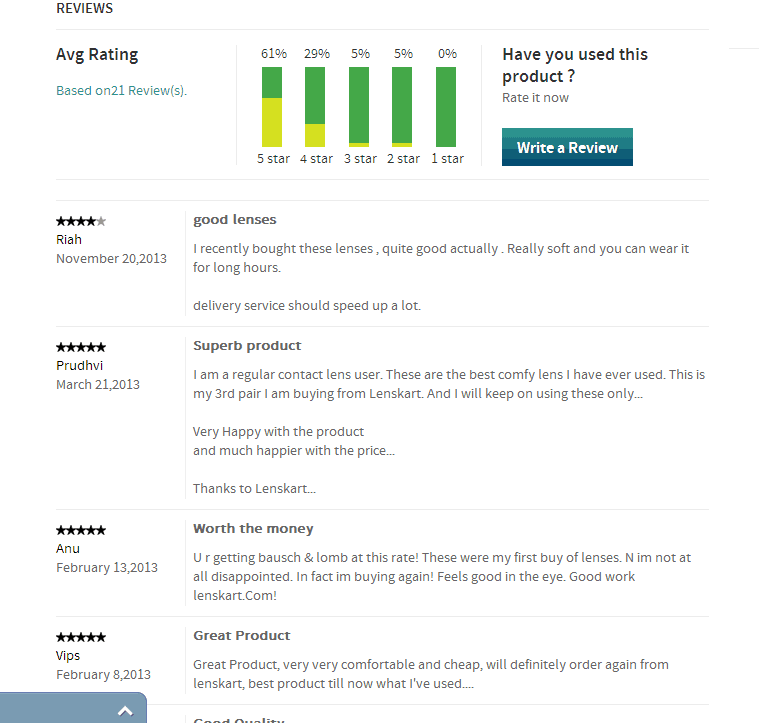 Including reviews is a great way to help shoppers like me. We can easily compare similar products and decide right product to shop. Also, they added Social Media Feeds, Video Testimonials, and Buying Guide in Video Format too. According To me Full marks for their Website and Offerings. So this was my shopping and review about Lenskart.com. Hope this will help you all. Now I am eagerly waiting for my parcel to arrive.